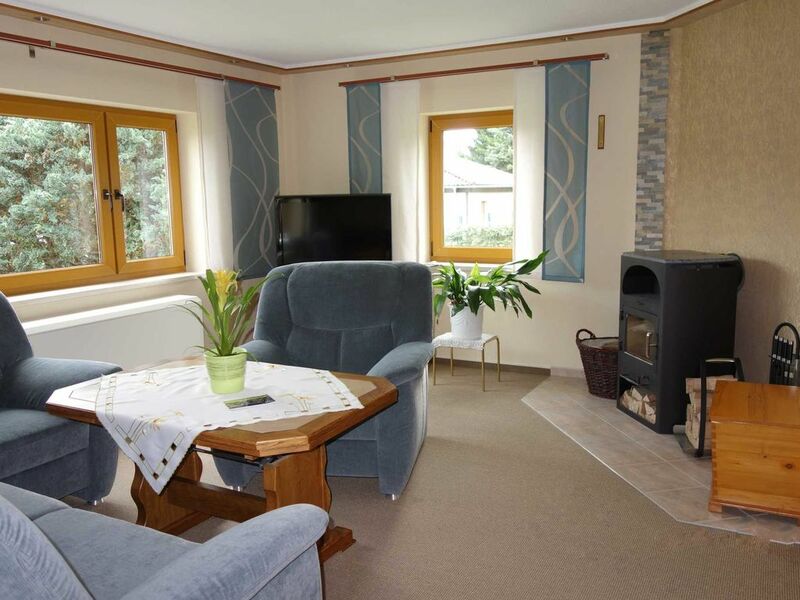 The central Nachspeicherheizung guaranteed in every season a pleasant warmth and the fireplace in the spacious living room provides additional comfort. For the stove in the living room we provide the wood. There are 2 bedrooms, both of which can be darkened with shutters by the windows. One bedroom has a double bed, the other 2 single beds, where the headboards are height adjustable. The interior of the kitchen includes u. a. Refrigerator with freezer, sink, ceramic hob, induction hob, coffee maker, kettle, microwave, cutlery and crockery. Small dogs up to 7 kg are welcome at no extra cost. Welcome to the house 2 with family Nelius. Here you can enjoy your stay. The house with 65 m² living space in a modern room design and solid construction offers relaxation in natural surroundings. The spacious living room with satellite / TV, radio, Wi-Fi and fireplace, two separate bedrooms, a fully equipped kitchen, shower / WC, winter garden, also with TV and radio and the covered terrace with garden furniture. Das Ferienhaus strahlte von Sauberkeit und Gemütlichkeit, ist mit sehr viel Liebe eingerichtet. Es fehlte absolut nichts. Die Besitzer sind sehr hilfsbereit und jederzeit erreichbar.Die Fahrt nach Braunlage dauerte nur 30 Minuten, zur nächsten Einkaufsmöglichkeit waren es ca. 2 km. Im Großen und Ganzen würden wir wieder uns sehr gerne dort aufhalten! Sehr gut ausgestattet, sauber und naturnah gelegen. Sehr freundliche Vermieter und toll für Familien. The house is located in Stiege quite central, yet quiet on a 1000m ² large nature plot. From here you have a beautiful view of Stieger Castle and the adjacent lake. The large lawn offers rest and relaxation or space for play and fun. In the evening you can enjoy by the fireplace. You can park your car directly at the house. Due to its central location, in the heart of the Harz Mountains and good transport connections Stiege is an ideal starting point for many different excursions in the whole Harz.